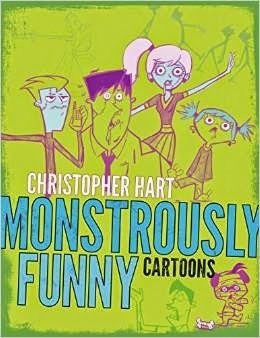 As someone who's hopeless at drawing, I was very interested in the book Monstrously Funny Cartoons. The author, Christopher Hart, gives step-by-step instructions for drawing a variety of ghoulish figures including zombies, monsters, mummies and vampires. 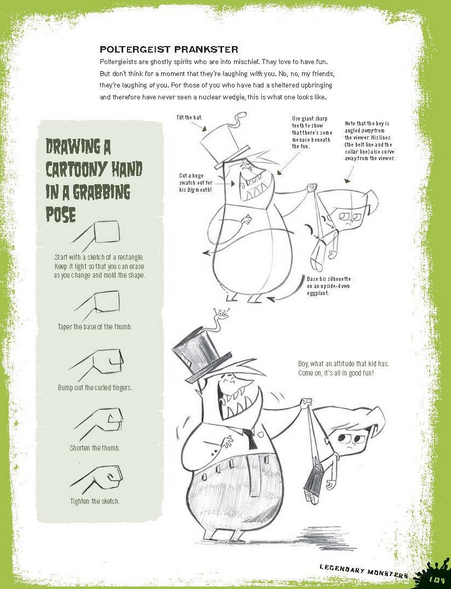 The book is illustrated with black and white drawings showing how to construct your scary character from scratch. Also, there is lots of advice and information for artists that I probably would never have considered. Such things as how to vary the shapes of eyes to convey different emotions (stunned, puzzled, suspicious, etc.) and how placement of features can be used to vary expressions are explained and illustrated. Classic traits for the various "monsters" are also included. For instance, no self-respecting vampire would be seen without his trademark fangs, shadowy eyes, fussily-styled hair and "ears that suggest that his mom had a fling with Mr. Spock." In addition to covering the stock horror characters, the author also has advice on how to come up with your own characters and tweaks you can use to make the drawings unique. It was also very interesting to see how an artist can convey such things as movement and action based on how the character is posed. The final chapter of the book discusses how to place your characters in scenes. While this might sound labor-intensive, examples show how easy it is to create a background in which a few elements will help to set the scene. Overall, this would be a fantastic book for the budding cartoonist. Even someone as artistically challenged as myself can be inspired to follow the easy directions to create ghouls and zombies of my own! I think this book would be very useful and inspirational to a young person who was interested in drawing or doodling. The author shows how to develop characters at each stage of the drawing, and the creepy subject matter is both entertaining and interesting.